Dream italy vacation for 2! Enter Your Email to Sign Up and Receive Notice of Winning! NO PURCHASE IS NECESSARY TO ENTER OR WIN. MAKING A PURCHASE WILL NOT IMPROVE ENTRANT’S ODDS OF WINNING. SUBJECT TO ALL FEDERAL, STATE, LOCAL AND PROVINCIAL LAWS, REGULATIONS, AND ORDINANCES. PSILoveItaly.com gives away an Italy Dream Vacation. Entrance for the giveaway begins at 12:01 AM Pacific Daylight Time (“PDT”) the first day of the announcement and continues until the winner is announced on April 25, 2019. 1. ELIGIBILITY: The PSILoveItaly.com Giveaway (the “Giveaway”) is open to legal residents of the United States and the District of Columbia (except those residing in ID, NE, PR, WV, US Virgin Islands and other US territories and possessions and military installations), United Kingdom and Canada (except Quebec), who are the legal age of majority in their jurisdiction of residence as of the date and time of entry. If any entry received from a resident of Canada is selected as a potential winner, potential winner will be subject to the process outlined in the section titled “SELECTION AND NOTIFICATION OF WINNERS”. Employees and directors of PSILoveItaly.com or any of their parent companies (or subsidiaries thereof), affiliates, representatives, consultants, contractors, legal counsel, advertising, public relations, promotional, fulfillment, and marketing agencies, and members of their immediate families (spouses, parents, children, siblings and their spouses, regardless of where they live) and those living in the same household are not eligible to enter. Participation constitutes Entrant’s full and unconditional agreement to these Official Rules and to Sponsor’s decisions, which are final and binding in all matters related to the Giveaway. Sponsor reserves the right to verify the eligibility of Winner. Any entry shall be rendered void if in contravention of these Giveaway Rules (“the Official Rules”) or where prohibited or restricted by law. 2. TO ENTER: For a chance to win the Prize, participants (“Entrants”) may enter the Giveaway during the Giveaway Period by filling out completely and accurately an online entry form at P.S I Love Italy Contest Entry (the “Website”). In the event of a dispute regarding an entry, entries will be deemed made by the authorized account holder of the email address submitted at the time of entry. The authorized account holder is the natural person who is assigned to the email address by an internet access provider or other organization that is responsible for assigning email addresses or the domain associated with the submitted email address. 3. SELECTION AND NOTIFICATION OF WINNERS/ODDS: Sponsor will select one (1) potential Winner using a random drawing method from the pool of all eligible entries received up until the end of the Giveaway Period. The drawing time and date is located at P.S. I Love Italy Contest Information. Odds of being selected as a Winner are based on the total number of eligible entries received up until the date and time of the drawing. The name chosen as a potential winner will be advised of the prize that they are eligible to win. If the prize notification by Facebook Message or Email is not answered after 3 attempts, if the email notification is returned as undeliverable, or if a potential winner is disqualified or otherwise determined to be ineligible or declines to accept the prize within five (5) days of notification, or refuses or fails to comply with the Acceptance Criteria detailed below, the prize will be forfeited and an alternate potential winner may be selected at random from the remaining eligible entries received. b. Sign an Affidavit of Eligibility, Liability & Publicity Release (where permitted by law) within ten (10) days of notification (as detailed in the heading “Release and Limitations of Liability”). a. 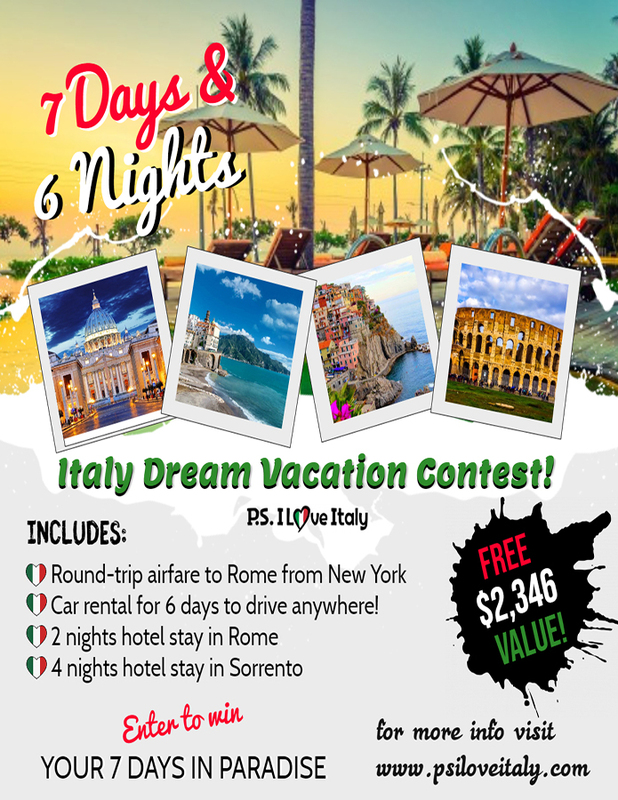 PRIZE: One (1) Entrant will receive one Italy Dream Vacation. b. PRIZE VALUE: Prize is currently valued at $2,346. 6. PRIZE RESTRICTIONS: Sponsor reserves the right to offer only the stated prize by random drawing among all legitimate, unawarded, eligible prize claims. No more than one (1) prize will be offered to an Entrant and only one (1) prize will be offered per household. 7. GENERAL CONDITIONS: Sponsor, and its affiliated companies, may contact Entrants for marketing purposes by email or post regarding publications and information relating to its products, offers and services. Entrants consent to be contacting in such manner by entering to win. No purchase or any good or service is necessary or required to enter or win. Purchase of any good or service marketed to an Entrant will not increase the likelihood of winning. Entrants may withdraw consent at any time by sending a written email request to this effect to the address below: support@PSILoveItaly.com Subject: OPT OUT. All Entrants will conduct themselves in a decorous manner at all times during their participation in the Giveaway. Sponsor reserves the right to disqualify any Entrant if such Entrant has engaged in, or during the Giveaway engages in, any act which, in Sponsor’s sole judgment, involves moral turpitude or which brings Sponsor or Entrant into public disrepute, contempt, scandal or ridicule, or which damages, denigrates or injures the reputation or success of Sponsor or its products or services. Sponsor does not reserve the right to cancel the Giveaway once announced. Sponsor may prohibit an Entrant from participating in the Giveaway or winning a prize if, in its sole discretion, it determines that Entrant is or has attempted to undermine the legitimate operation of the Giveaway by cheating, hacking, deception or other unfair playing practices or intending to annoy, abuse, threaten, or harass any other Entrants or Sponsor representatives. WARNING: ANY ATTEMPT BY ANY PERSON TO DELIBERATELY DAMAGE ANY WEBSITE ASSOCIATED WITH THIS GIVEAWAY OR UNDERMINE THE LEGITIMATE OPERATION OF THE GIVEAWAY IS A VIOLATION OF CRIMINAL AND CIVIL LAWS AND SHOULD SUCH ATTEMPT BE MADE, SPONSOR RESERVES THE RIGHT TO SEEK DAMAGES FROM ANY SUCH PERSON TO THE FULLEST EXTENT PERMITTED BY LAW. Sponsor’s failure to enforce any term of these Official Rules shall not constitute a waiver of that provision. 8. RELEASE AND LIMITATIONS OF LIABILITY: By participating in this Giveaway, Entrants agree that Sponsor and their shareholders, affiliates, subsidiaries, representatives, consultants, contractors, legal counsel, advertising, public relations, promotional, fulfillment and marketing agencies, and their respective officers, directors, employees, representatives and agents (the “Released Parties”) are not responsible for: a. any incorrect or inaccurate information, whether caused by Entrants, printing errors or by any of the equipment or programming associated with or utilized in the Giveaway; b. technical failures of any kind, including, but not limited to malfunctions, interruptions, or disconnections in phone lines or network hardware or software; c. unauthorized human intervention in any part of the entry process or the Giveaway; d. technical or human error which may occur in the administration of the Giveaway or the processing of entries; or e. to the extent permitted by law, any injury, loss or damage of any kind to persons, including personal injury or death or property which may be caused, directly or indirectly, in whole or in part, from Entrant’s participation in the Giveaway, downloading any materials, acceptance, possession or receipt or use or misuse of any prize. To the extent permitted by law, by participating in this Giveaway, Entrants agree that the Released Parties will have no liability whatsoever for, and shall be held harmless by Entrants against any claims based on publicity rights, defamation or invasion of privacy. Released Parties are not responsible if a prize cannot be awarded due to travel cancellations, delays, or interruptions due to acts of god, acts of war, natural disasters, weather, or terrorism. 10. DISPUTES: To the extent permitted by law, Entrant agrees that: (1) any and all disputes, claims and causes of action arising out of or connected with this Giveaway or any prize awarded shall be resolved individually, without resort to any form of class action, and exclusively in the State and/or Federal Courts of the State of Washington; (2) any and all claims, judgments, and awards shall be limited to actual out-of-pocket costs incurred, including costs associated with entering the Giveaway, but in no event attorneys’ fees; (3) under no circumstances will Entrant be permitted to obtain awards for, and Entrant hereby waives all rights to claim, indirect, punitive, incidental and consequential damages and any other damages (other than for actual out-of-pocket expenses), any and all rights to have damages multiplied or otherwise increased. All issues and questions concerning the construction, validity, interpretation and enforceability of these Official Rules, or the rights and obligations of the Entrant and Sponsor in connection with the Giveaway shall be governed by, and construed in accordance with, the laws of the State of Washington, without giving effect to any choice of law or conflict of laws rules of any other jurisdiction, which would cause the application of the laws of any jurisdiction other than the State of Washington. 13. MISCELLANEOUS: Any names and addresses acquired during the course of this Giveaway will be used for the purpose of soliciting additional services. This Giveaway is neither an offer to sell nor a solicitation to residents in jurisdictions in which registration requirements have not been fulfilled, and your eligibility will depend upon the state of residency of the Entrant. © 2019 PS I Love Italy - ALL RIGHTS RESERVED.